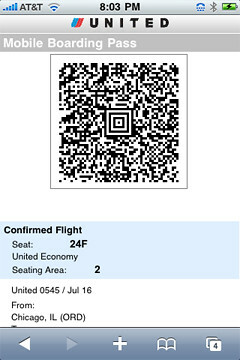 Many airlines now offer mobile boarding passes which enable you to check in using your phone - the challenge is whether you can invoke the relevant screen on your device as you're about to board the plane.Essentially the sequence of events is that once you check in online you can opt to send your boarding pass to your mobile device, which means getting an email link you open on it. Many airlines now offer mobile boarding passes which enable you to check in using your phone - the challenge is whether you can invoke the relevant screen on your device as you're about to board the plane. Essentially the sequence of events is that once you check in online you can opt to send your boarding pass to your mobile device, which means getting an email link you open on it. On an iphone you see a screen like the one here, in this case far a United Airlines flight. With airport cellular reception spotty and wifi connectivity pricey it can be a gamble relying on your phone to get you onto the plane, since the boarding pass is essentially a unique web page with your barcode on it. The solution is to take a screenshot on your phone and have it stored ready for when you board. To take a screenshot on an iphone you get your mobile pass onscreen then press the sleep button at the top and the home button at the same time, you'll find your screenshot in the images folder. Other phones have similar ways to capture what you're seeing onscreen. I've done this for several flights recently on an iphone and can confirm it works. If you've got multiple flights saving them in sequence, making sure you capture all your gate details etc which might require two snapshots top to bottom) makes life simpler. Now all you have to do is nurse your phone battery so it doesn't die on you while you're waiting to board!